If the noise and stress of city life is getting to be too much for you, why not visit some gardens and arboretums in Staten Island. A wonderful place for lovers of peace and quiet, and those who want to get back in touch with nature Staten Island botanical gardens are refuges for all. Find exotic plants and trees of all sorts in gardens in Staten Island. Culture and Nature Combined in these Great Staten Island Gardens! These botanical gardens in Staten Island are over 35 years old and have evolved and changed for the better each year they've existed. The gardens are uniquely merged with the Snug Harbor cultural center - cultural performances, education events and more take place here year round. One beautiful stop on your garden visit will be the Tuscan Garden. Designed by a cooperation of leading Italian architects and gardeners with local specialists, this garden is host to many Italian cultural events as well as olive and lemon trees, beautiful topiary and a vineyard. 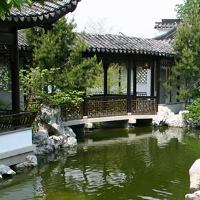 Visitors to the gardens won't want to miss the Chinese Scholar's Garden - a tranquil walled in area styled after a traditional Chinese garden features pavilions and covered walkways that arch over waterways where fish calmly swim. The Snug Harbor gift shop has a wide selection of unique jewelry, gift items, garden tools, accessories and souvenirs. Snug Harbor botanical gardens are open Tuesday through Sunday from dawn to dusk.